Did you miss the last Working Cities Wednesday? No problem. Here are some actions you can join in our community. Connect with the lead and get involved today. Community Navigators would act as engaged residents connecting neighbors and other interested residents to resources with a personal touch. What would outreach look like? How to bring community together to envision goals. Discussion: Meet all Wassaic-NYC trains with BRTA buses running from North Adams to Great Barrington and then express to Wassaic. Frequent, reliable, inexpensive early and late service. Most riders will be inside the Berkshires and it will expand available employment radius. Things to do before next meeting: Talk with city counselors and state reps. Poll possible riders. Summary of Discussion: Route from downtown to rail trail access. How to find funding mechanisms. How to gather together interested riders? Things to do before next meeting: Have a neighborhood bike ride. Begin greater outreach to neighbors. Education on bike safety to raise awareness? Resources needed: Contacts within PCTV, Berkshire Cycling Association, bike shops. Greater knowledge of funding opportunities. Working Cities flipped the conversation for its first ever Candidate Mixer. Instead of asking candidates to offer speeches and policy ideas, residents challenged them to listen first. 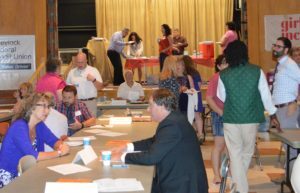 Candidates sat at tables while residents circulated and exchanges their thoughts, concerns, and ideas. Every person running for Pittsfield City Council attended, plus candidates for City Clerk and School Committee. At the end of the evening, candidates were charged with reporting back to the group what they heard. The event was shared on Facebook Live and is still available to view on the Working Cities Pittsfield page. If candidates don’t hear from residents, they cannot make informed policy decisions. Working Cities Pittsfield works to encourage conversations with elected officials.